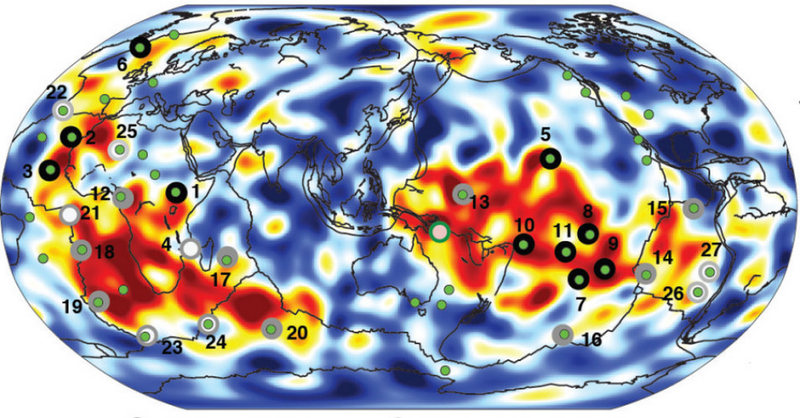 This visualization of the plumes of hot rock rising through the mantle correlate to hotspots around the planet where we observe the ongoing generation of chains of volcanic islands. Earth's crust consists of oceans and continents. Underlying the crust is the mantle which is about 1,800 miles thick. The mantle consists of hot but solid rock. Below the mantle is the outer core which is a liquid layer of molten iron and nickel. And many a fire there burns beneath the ground. 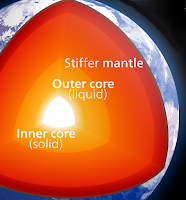 The inner core is solid iron. Heated by the hot core, rock in the mantle rises and falls. Plumes of hot rock occasionally penetrate the crust to produce volcanoes. As Earth's crust moves laterally around the planet via plate tectonics, the hot stationary rock in the mantle penetrate the crust to generate chains of islands. The Galapagos, Cape Verde, Samoa, Hawaiian, and Canary islands are examples of volcanic island chains created by Earth's crust moving laterally over stationary super-heated mantle rock. 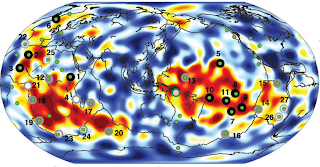 CT scan of Earth links deep mantle plumes with volcanic hotspots, Science Daily, 2 September 2015. Structure of the Earth, Wikipedia.